Health in Chinese medicine is based on observable laws of nature and alignment with these cycles… like night and day and the four seasons. From this body of knowledge comes one of the most useful potions in any home medicine cabinet: The Law of Midday/Midnight. How amazing! 5000 years ago this ancient culture’s physicians knew that our organ systems participated in these daily rhythms that we now call circadian rhythms. Further, these rhythms can be used as a barometer of our health, much like the dashboard on a car, as an early warning signal. So for instance, the stomach’s peak period is from 7-9 am, in the morning, right when we should be eating breakfast to gear up for our day ahead. Do you find that you have little appetite in the morning? This may be a signal from your stomach that it is lacking sufficient energy to raise your appetite during its peak time from 7-9 am, or signaling that it is overfull from the night before, barely having digested that late night meal. The stomach’s low period is from 7-9 pm, at night when many Americans eat their biggest meal. If this is your rhythm, you are placing a stressful demand on your stomach organ to do work when it should be resting. If our eating habits were in line with the body clock then we would eat a big breakfast at stomach time from 7-9 am and a main meal at 1pm, the time of the small intestine. Our evening fare would be very light, maybe fruit or soup or even a glass of wine. 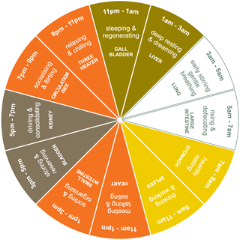 In counseling people around weight loss and metabolism, I tell them to first put their eating in concert with the body clock and then to go through a full cycle of seasons with this pattern. It will take a whole cycle to fully reset your metabolic pattern of eating. But if you do you may find those extra pounds sloughing off naturally! What other advice does the Clock offer? Do you find yourself getting drowsy between 3-5 pm just when that last report is due? Even coffee doesn’t help! This is a signal from your bladder organ that your reserves are low. Your adrenalin cannot get you through the home stretch. To help, drink more water and get more sleep. Or, maybe you wake fitfully every night between 1 and 3 am? In Chinese medicine this is the time of the Liver organ, the seat of our imaginative soul. Tossing and turning won’t help but taking a walk or moving about or allowing one’s mind to wander and dream will. Invariably the organ times follow grandma’s adages about eating, sleeping, working, resting, and making love. If we follow these natural cycles they are our best insurance that our systems will run as smoothly as a well-oiled car. And, like a car, if something is awry with one of our organ systems, signals will appear on your two hour dashboard alerting you to the need for preventive maintenance. Just ask yourself: What time of day do you feel the best or its” opposite”, the worst? Your body is trying to tell you something! Copyright© July 2012 – Jane Grissmer, M.Ac, L.Ac., Dipl.Ac.